Christmas has officially arrived in the retail world. The John Lewis advert is viral, the Coca Cola trucks are out and the holidays are coming. As always London leads the way adorning itself for the festive season. For 2014, Christmas at Aspinal continues the seasons theme drawing inspiration fantasy fairytale forests, snow queens and frozen landscapes. Stage one of our windows starts to tell the story using striking gold broken branches with rich textured products and bright berry explosions of colour. Inspired by C.S. Lewis' Narnia and traditional Cossack folktales, the windows will change again and further explore the theme of nature sleeping, the magic of the forest and the wintry beauty of wild creatures and beautiful princesses. This is a high-fashion fairy tale. Last week our luxury department store stockists have revealed their world-famous festive window displays of 2014 featuring a host of home-grown and international luxury labels, alongside limited-edition pieces from fashion, beauty, and home ranges. Aspinal has long been established as the ultimate one-stop shop for your every festive need. 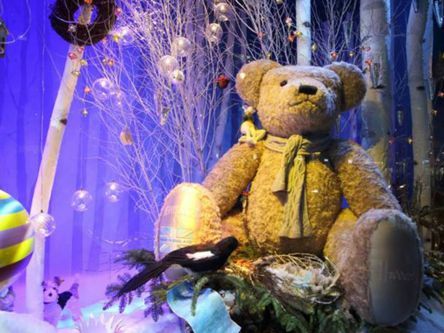 Stop by the windows at our stores to explore a world of wonder, enchantment and imagination for yourself.